Petr Prucha and the New York Rangers host Antero Niittymaki and the Philadelphia Flyers tonight at Madison Square Garden. The Rangers have won five of seven meetings so far. With two-thirds of the NHL's teams hitting the ice Tuesday night, the playoff picture will be significantly altered. At 7 p.m., the Buffalo Sabres host the Ottawa Senators, the Pittsburgh Penguins battle the New Jersey Devils for the top spot in the Atlantic Division and the Washington Capitals continue their playoff push in Carolina. A half-hour later, the Philadelphia Flyers go for their fourth win in a row when they face the New York Rangers, the Boston Bruins look to maintain their playoff spot when they square off against the Toronto Maple Leafs and the Florida Panthers continue their late-season push against the Tampa Bay Lightning. Later, the Columbus Blue Jackets visit the Nashville Predators, the Detroit Red Wings take on the St. Louis Blues, the Calgary Flames host the Vancouver Canucks and the red-hot San Jose Sharks skate into Phoenix. * The Senators, who once had a stranglehold on the Eastern Conference lead, now are in fifth place in the conference and are just three points ahead of the seventh-place Flyers. Ottawa, which has lost three of it last four games, has allowed 19 goals during that span. * Buffalo center Derek Roy has four goals and eight assists for 12 points in his last nine games. Roy, whose 20:56 of average ice time is the highest among Sabres forwards, has the second-most points among Buffalo players with 70. * Penguins right wing Petr Sykora, who has the second-most goals on the team with 28, has seven goals and six assists for 13 points in his last eight games. Sykora, who spent his first seven NHL seasons with the Devils, has four goals and nine assists for 13 points in 13 career games against New Jersey, including three goals and six assists for nine points in seven games this season. * The Devils, who have lost their last three games and have slipped to fourth place in the Eastern Conference with 91 points, have scored one goal in each game. * Washington, which is just two points behind the eighth-place Bruins with 82 points, plays its last six games against teams with less than 90 points. * Carolina center Tuomo Ruutu has one goal and five assists for six points in 11 games since being traded by Chicago on trade-deadline day. * The Flyers, thanks in part to their second-best power play (22.5 percent), have six players with at least 20 goals. 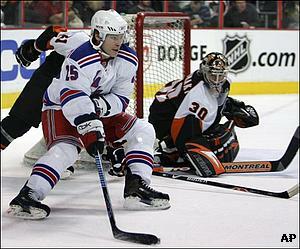 * Rangers center Chris Drury, who leads the team with 23 goals, has scored just one goal in his last eight games. * The Bruins, who currently hold the eighth and final playoff spot in the Eastern Conference with 84 points, will play two of their closest competitors – the Maple Leafs and Bruins – twice each over their final seven games. * Florida center Kamil Kreps leads Southeast Division rookies with a plus-11 rating. * Tampa Bay's Paul Ranger, who leads the team's defensemen with 31 points, has four assists in six games against the Panthers this season. Ranger, who has played a larger role with defenseman Dan Boyle out of the lineup for lengthy stretches, beat the odds just to make it to the NHL after being selected No. 183 overall in the 2002 NHL Entry Draft. * The Maple Leafs have won five of their last six games and are just four points out of the final playoff spot in the Eastern Conference. * Since being named team captain March 12, Columbus left wing Rick Nash has three goals and five assists for eight points in five games. * The Predators, who are just four points out of a playoff spot in the Western Conference, play just one team currently in the top eight in the conference in their final six games. * Detroit, which has a seven-point lead atop the Western Conference, has a 13-11-2 divisional record. * Blues left wing Paul Kariya, who has scored at least 30 goals in seven different seasons, has not scored in his last 19 games and has just 15 goals this season. * Sharks goalie Evgeni Nabokov, who leads the League with 43 wins, has played in 71 of San Jose's 75 games this season and has not lost in regulation in his last 13 games. He's allowed more than three goals just once during that span. * After recording just seven points in 57 games with the Capitals, left wing Matt Pettinger was traded to the Vancouver Canucks on trade-deadline day. Pettinger, who is playing alongside Markus Naslund and Brendan Morrison, has three goals and two assists for five points in 13 games with the Canucks. * The Flames, who are just two points ahead of Vancouver in the Western Conference playoff race, play the Canucks three more times, starting tonight, over their final seven games. * Phoenix right wing Shane Doan, selected No. 7 overall by the Winnipeg Jets in the 1995 NHL Entry Draft, has two goals and five assists for seven points in his last three games.